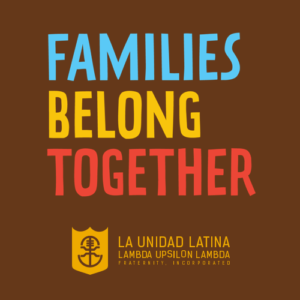 Press Release | La Unidad Latina, Lambda Upsilon Lambda Fraternity, Inc.
Our Hermandad is deeply concerned with the current administration’s decision to separate undocumented children from their families. We not only empathize with the sadness and frustration this causes for Hermanos and members of our community but stand firmly in solidarity with immigrant families. La Unidad Latina believes it is important to not remain silent when our communities are under attack. During these turbulent times, we encourage, empower, and support Hermanos’ collective action against human rights violations and the separation of children from their parents. Let us continue to unite together and tackle one of the most pressing issues of our time. The family separation crisis is not over. Wednesday’s signed executive order does little to make immediately clear whether, or when, detained children will be reunited with their parents. It also potentially places children in more harmful spaces as adult facilities are threatening and unfit for children. Separating children from their family is not a political stance, it is inhumane. La Unidad Latina calls for a stop to all practices that hurt the physical and psychological well-being of children and urge public servants to create policies that are aligned with our values as a nation. Hermanos and community members are encouraged to take immediate action. Below are some resources that are readily available. Text RESIST to 50409 to find your elected officials. Please do not hesitate to contact us for additional resources or how you can get involved. This entry was posted in Press Release on June 22, 2018 by Chris. Our Hermandad is deeply concerned with the decision of the current administration to end the Deferred Action for Childhood Arrivals (DACA) Program. We empathize with the sadness, fear, and anxiety this causes Hermanos and members of our community. There are an estimated 800,000 undocumented persons who would be deeply affected by such an action. The provisions within DACA allow for undocumented persons to remain positive contributors to our society. Our Hermandad seeks to provide greater opportunity for all persons to pursue an education and advance our communities. To remain silent in the face of looming threats to our community would be an affront to stated values. We are frustrated with the inability of our elected officials to propose and ad opt a more permanent solution to the issues facing undocumented members of our communities. We, alongside peer organizations, invite them to the table so that we may collectively address the challenges we are facing. Information regarding work permits, social security numbers and driver’s licenses. To allied Hermanos and community members we ask that you engage in this work. You can contact your United States Representative and Senator. You can urge Congress to support the 2017 DREAM Act (S. 1615) and create a comprehensive immigration plan. We have a responsibility to one another as Hermanos and community members. In moments like these La Unidad Para Siempre extends well beyond the confines of La Fraternidad. It serves as a reminder that there is strength and hope in unity. 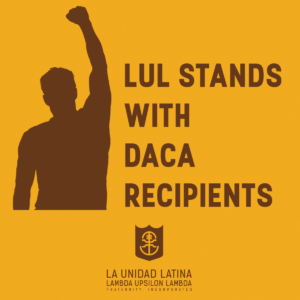 As La Unidad Latina, Lambda Upsilon Lambda Fraternity, Inc. we support our undocumented community members and those affected by their circumstances. This entry was posted in Press Release on September 5, 2017 by lul-admin. In the wake of an investigation conducted by the fraternity and upon careful consideration by the Board of Directors, La Unidad Latina, Lambda Upsilon Lambda Fraternity, Inc. will close its Epsilon Chapter, effective immediately. As a governing body, the Board of Directors is charged with ensuring the long term vision and direction of the organization. It is through this sense of obligation that the Board was required to consider this unprecedented scenario. There was no one incident, or action, that led to this judgement. Over the course of several months, the Board of Directors held a series of deep and carefully considered discussions. This included a comprehensive report that considered not just the challenges currently attributed to Epsilon Chapter, but its entire history, both positive and negative. After much consideration, the Board of Directors rendered a unanimous decision. This was not an easy decision to reach. The Board of Directors, with a sense of great sorrow and loss, had to make a decision that best reflected the interests of La Fraternidad. We will work with Hermanos of the Epsilon Chapter to help facilitate the transition during this unfortunate time. This entry was posted in Press Release on May 6, 2018 by Chris. First, we would like to say that our hearts and sympathies go out to all the victims of the shooting incident at Van Cortlandt Park on Saturday May 28th, 2016. There have been various reports linking our fraternity to this incident. After an internal investigation, we would like to clarify a few of the facts regarding this unfortunate event. – The shooting in question did not occur during our cookout, but rather at an adjacent cookout a few hours after our event had officially ended. – No fraternity member was involved in triggering the altercation that led to the shooting. – No fraternity member was injured at any point. – One fraternity member on the scene was an off-duty Emergency Medical Technician (EMT) and provided first-aid to the injured in the immediate aftermath until more help arrived. Several news outlets have attributed the events of that evening to our organization. Based on multiple eye witness accounts, we believe this to be incorrect. We are, however, thankful the aforementioned brother was on the scene to provide aid in such a tragic situation. We celebrate his potentially life saving actions, and believe he represented our fraternity’s values in the best possible way. As an organization that strives to advance the communities we represent, it is our duty to provide safe environments for our events. Therefore, we have informed all of our members to fully cooperate with the authorities during their investigation, and ask that anyone with information about what transpired to please step forward and contact the appropriate authorities. This entry was posted in Press Release on June 1, 2016 by lul-admin.